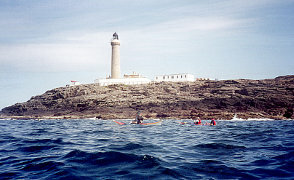 For many members, the west coast is further away than venues like the Farne Islands, and offers fewer interesting places to paddle. However, when the North Sea is angry, the Irish Sea can provide paddling and St. Bees' cliffs have plenty of wildlife as well as rock-hopping among the boulders. 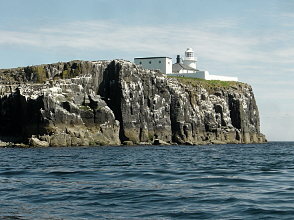 The Farne Islands provide the same sort of interest that we find in the tidal waters of western Scotland, but in a daytrip within a relatively short drive from the area where most SOC members live. It is also a premier wildlife destination early in the summer, but there are restrictions on where and when landings are permitted, as you might expect for a nature reserve. We have at least one trip out to the Farnes almost every year and if the weather is good, there may be several trips over the course of the season. 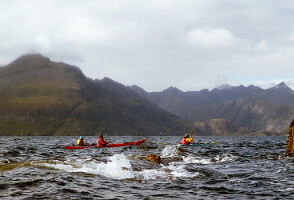 Skye offers coasts facing every direction, and varying from sheltered lochs with little tidal flow, to exposed coasts and tide races. Something for everyone in almost any weather. 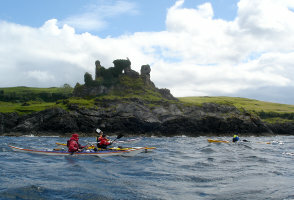 Lismore is an island, sheltered by the large island of Mull from worst conditions of the west coast, and in particular from ocean swell. Unlike a lot of Scotland, this is not igneous or metamorphic rock, but a limestone, which makes the island gently rolling and very green, with lots of clean freshwater springs around its coast. Ardnamurchan Point is a significant point on the west coast of Scotland. 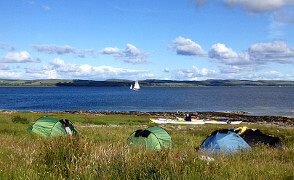 For sailors, it marks a change from a coast of bays and sea lochs with many sheltered anchorages and friendly ports, to a more rugged coast with fewer places of safety. 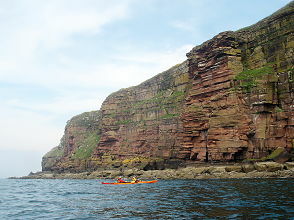 For the kayaker, to whom remote landings are more of a stock in trade, this division is less obvious, but nonetheless, as the most westerly point on the mainland, and very exposed to southwesterly wind and swell, it is a place to be treated with respect. We've had several trips visiting Bute in recent years:- sometimes just Bute and sometimes combined with visits to Arran, Inchmarnock and other odd places on the way. It offers the advantages of some water sheltered from the open sea, and a shorter drive than many of our haunts further north. There are a number of places we've used to put in (and a possibility we've not tried) and the choice at least partly depends on how much you've picked this area for a short drive, and how keen you are to avoid crossings.